Applying the EU ratio of total to actual mobile broadband subscriptions to the world total results in a guesstimate of 217 million mobile broadband subscriptions in mid-2009, just less than half of total fixed subscriptions. Fiona Vanier. September 2009. 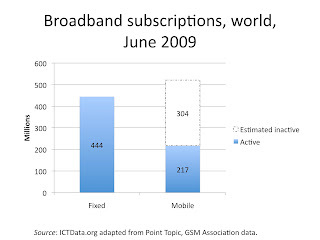 World Broadband Statistics: Q2 2009. Point Topic: London. European Commission. 18 November 2009. Broadband access in the EU: situation at 1 July 2009. Federal Communications Commission. 2010. High-Speed Services for Internet Access: Status as of December 31, 2008. Organization for Economic Cooperation and Development. March 18, 2010. Wireless Broadband Indicator Methodology.